Shulay Faberge 1991 by Eldyr ex Fayrelands Silver Lace. 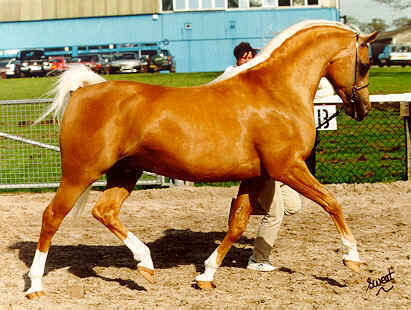 1994 British National Supreme Palomino Champion. 1995 Supreme Southern Palomino Champion. Many thanks to Phil and Pauline Gribben for allowing me to display this photo. Shulay Faberge is now standing at stud at Rainbow Arabians in Denmark.